We take a flight to Lukla and begin our trek to Phakding and then the trail follows the route of Dudh Koshi River to the Gokyo Valley. This is an exciting trek, visiting the high valleys of the Khumbu with side excursion to Gokyo Ri (5340m) to explore and view the best panoramic mountains- Everest, Amadablam, Lhotse Shar, Lhotse, Makalu, Cho Oyu and many other snowy peaks. The region lures thousands of trekkers to explore high mountain valleys, high passes, Buddhist Monasteries en route and experience Buddhist culture and religion. Day 01: Arrive in Kathmandu, transfer with assistance to Hotel. Day 02: Full day visit in Kathmandu city and evening free, preparation for trekking. Day 03: Kathmandu (1310m) - Lukla (2840m) - Phakding (2640m) 04:00hrs. Day 04: Phakding - Namche Bazaar (3440m) 05:00hrs. Day 05: Namche Bazaar - rest day for acclimatization. Day 06: Namche - Dole (4200m) 06:00hrs. Day 07: Dole - Machhermo (4410m) 04:00hrs. Day 08: Machhermo - Gokyo (4790m) 03:00hrs. Day 09: Gokyo - visit Gokyo Ri (5360m) 02:00hrs. Day 10: Gokyo - Dole (4200m) 06:00hrs. Day 11: Dole - Khumjung (3780m) 06:00hrs. Day 14: Lukla - Kathmandu (1310m) fly 30 minutes. Day 15: Departure transfer to onward destination. Meet us outside the airport, transfer to Hotel. Meet with trekking guide and discuss about necessary things. After breakfast, keep full day valley sightseeing with Kathmandu Durbar Square, the place of the Malla and then the Shah Kings of Nepal, visiting Kumari Temple, house of the virgin goddess, visiting Swoyambhunath, a stupa on the top of hill - from here you can overlook the scenery of Kathmandu, Visiting Patan city, the second largest town in the valley, Krishna Mandir, Golden Temple etc. This morning we will be transferred from your hotel to Kathmandu airport for our domestic flight to Lukla. The flight itself is awe-inspiring as we fly parallel to the Himalayan giants bordering Nepal and Tibetan China. Flying time to Lukla is approximately 40 minutes. There will be time to explore the village whilst the Sherpa crew sort and load equipment. Lukla lies at an altitude of 2850m. From Lukla we descend on a wide trail northwest to the village of Choblung in the Dudh Kosi Valley. The valley radiates energy through beautiful pine and rhododendron forest. The walking is easy and we follow the river's course, passing through the village of Ghat. We enter the park at Jorsale, cross the Bhote Kosi river and then climb steeply to Namche Bazaar. Namche is the main trading center for the Khumbu. To help with our acclimatization, we will spend a second night in Namche. During our second day here we will go to the Sagarmatha National park where we get our first views of Mt. Everest, Lhotse and Ama Dablam. After lunch we hike up to Kumjung to see the famous "Yeti" skull and the Gompa then to Khunde to see the Hillary Hospital. The Chorten mark path extends from Namche Bazaar and shortly the twin peaks of Thamserku soar into the sky at the east. Well known legend of Yeti is still alive here along with the Yeti-scalp preserved in Khumjung’s red-walled gompa. Ahead, we descend to reach Kumbila after a large chorten marking to the top of the ridge. Khumbila (5761) is the abode of the patron god of the Khumbu region close to the settlement believed to be the birth place of the lama who introduced Buddhism to the area. The trek continues descending from Phortse Tenga on the bank of Dudh Koshi. The trail then follows the river passing rhododendron, birch forest and Cho Oyu becomes visible through the blooms before reaching the Dole. Allowing us for enough time for acclimatization and enjoy the marvelous views we have short distance trek to Machhermo. We pass through summer yak pastures, small settlements and following the valley side far above the river. Machhermo, in khumbu, is renowned site for most credible yeti incident, Sherpa woman being attacked and 3 yaks killed in 1974. We have almost half day rest for acclimatization. The largest glacier in Nepal is few hours away after a pleasant climb towards the moraine of the Ngojumba Glacier. Further passing few beautiful small lakes to the tiny kharka of Gokyo we have an amazing view of the Cho Oyu along with the other snowy peaks. 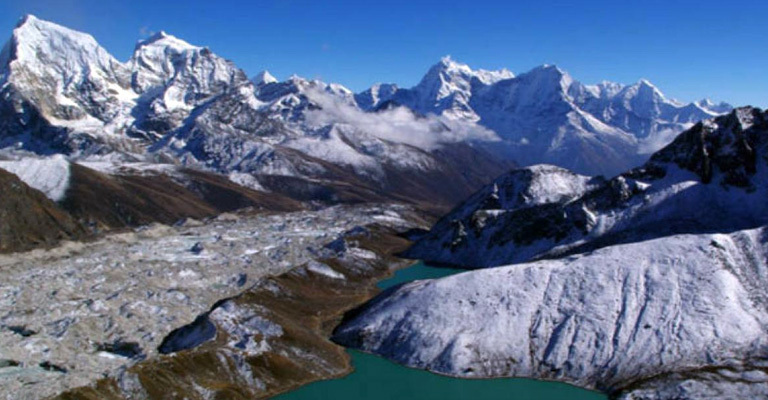 The highlight in the trek is the panoramic view of Gokyo Peak. It looks impressive not less than that from KalaPatthar, close to Base Camp. Other peaks like Cho Oyu, Gyachung Kang, Everest, Lhotse, Makalu, Cholatse, and Tawachee are too visible along with the increadable ice ridge between Cho Oyu, Ngojumba I and II and Gyachung Khang. It is one of the most mystic sights like a folding screen of ice, snow and rock in Khumbu region. Additionally, Ngojumba Glacier and serene glacial lakes lies below. We trek back the same falling route to Dole for overnight stay. Further, descend to Phunki Tenga and ascend till Khumjng, one of the largest Sherpa villages of the region. It also offers mystifying views of Amadablam. Finally, we make side excursion via a local Sherpa village to Hillary hospital and Hillary school. Today, we have an easy way down to the Phakding village via Namche Bazaar for Lodge stay. This day is the last day of our terrific trek ending with an easy way down to Lukla. Our representative will make necessary arrangements for your next day flight to Kathmandu. October is a great time to visit Nepal. Even though most people are rushing off to the Everest Base Camp, there are still a large number of tourists in and around Kathmandu. The infrastructure in Kathmandu does not support the current population of over 5 million, but it is still an an exciting city. There is much to see, even looking out the car window. And being stopped in traffic is a great time to get candid photos of the ordinary people on the streets. Having a driver was a necessity and my driver was excellent. I could totally relax and watch the city as we drove through different areas. Things went wrong, but alternate arrangements were quickly made so I was able to see what I wanted to see. The most important asset is flexibility. When something was not possible to do as planned, there were other things to do and Friendship Nepal Tours was able to make alternate arrangements quickly. Visiting the Chitwan Park is an essential part of the Nepal experience. Although it is possible to fly in to the area, driving provides an excellent view of how the people live outside Kathmandu. Everest Conservation entrance fees & Trekking permit (TIMS).